It is with great sadness that we report that legendary actress, stage personality and icon Debbie Reynolds has passed away at age 84. According to Deadline, Reynolds suffered a stroke only a day after learning of the untimely death of her daughter Carrie Fisher (Star Wars, When Harry Met Sally) yesterday, and later passed away at Cedars Sinai Medical Center. Reynolds’ major claim to cinematic came at age 19 when she co-starred with Gene Kelly and Donald O’Connor in Stanely Donen’s timeless 1952 musical classic Singin’ in the Rain. The singing continued in 1957’s hit Tammy and the Bachelor, which spawned the Oscar-nominated gold record “Tammy.” She would parlay her gifts as a songstress as a major Las Vegas headliner in the ensuing decades, as shown in 1998’s ’70s period piece Fear and Loathing in Las Vegas, where she made a voice cameo. Other major roles for Reynolds include The Tender Trap (1955) opposite Frank Sinatra, How the West Was Won (1962), an Oscar-nominated turn in The Unsinkable Molly Brown (1964), The Singing Nun (1966) and voicing the title character in the animated film Charlotte’s Web (1973). In more recent years, Reynolds made a splash (and scored a Golden Globe nod) playing doting mom to Albert Brooks in Mother (1996), Kevin Kline’s mother in the hit comedy In & Out, and her final screen role as Liberace’s mother Frances in Steven Soderbergh’s Behind the Candelabra (2013). Mike Nichols’ 1990 comedy Postcards from the Edge, based on Carrie Fisher’s semi-autobiographical novel, featured Meryl Streep and Shirley MacLaine playing fictionalized versions of Fisher and Reynolds. 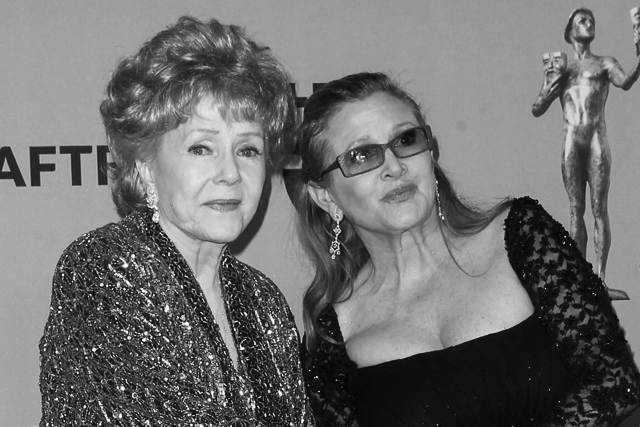 In 2001, Reynolds appeared opposite MacLaine, Elizabeth Taylor and Joan Collins in the TV movie These Old Broads, with a script penned by Carrie Fisher. Reynolds is survived by her son Todd Fisher and her granddaughter, actress Billie Lourd (Star Wars: The Force Awakens, “Scream Queens”).